Wilson Komen was born and raised in Eldoret, Kenya. 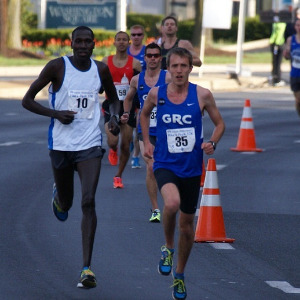 He began his running career at age 19 under the guidance of Coaches Lalang, Kirwa, and Leting. Wilson has competed internationally in Canada, Bermuda, Barbados, Europe, and the United States. During that time, he had the opportunity to train with many distinguished long distance runners, including Paul Tergat, Patrick Ivuti, Moses Tanui, and William Kiplagat. In addition, Wilson was invited to train with the Swedish National Team. Wilson’s racing experience has spanned the broad spectrum of running distances, from shorter track races to the full marathon. He assists all of his trainees—regardless of experience and ability—to achieve peak performance and, most importantly, to feel a sense of joy and fulfillment whenever they run. To that end, he tailors his training plans to meet the individual aspirations of each of his runners. He is skilled in road running and racing strategies, specifically for the distances between the 5KM and the full marathon. Coach Wilson’s training is based in mesocycle sports periodization, to allow for distinct base-building and performance phases, to improve overall strength and endurance, while helping runners to improve their form and to minimize injuries. Success. Coach Wilson Komen has been notified of your message.